The futon mattresses are typical of the Japanese culture. 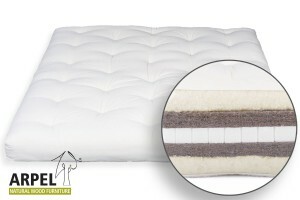 Originally they were considered as "thin rollable mattresses". 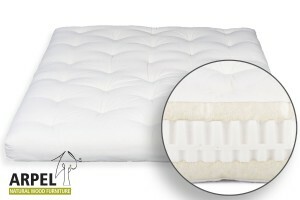 Futon mattresses are now popular in modern western cultures as well for their versatility and adaptability to the body shape. The futon is a quilted mattress (with non removable fabric) with internal layers (not tufts) of pure raw fiber carded cotton or virgin wool. Additionally, some models have latex or coconut mat layers. The carded cotton or wool represent the main elements of this product. The addition of latex and coconut fiber layers can increase ergonomics and breathability, they also add more stability and stiffness to the cotton layers. You can find more information in the Japanese Futon section. This product can be sent directly to your doorstep! For custom requests regarding our futons just contact-us! 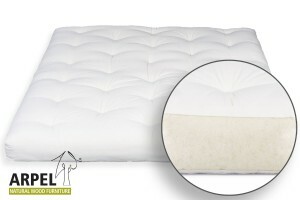 The futon is a quilted mattress, therefore the fabric is not removable and it can only be cleaned with stain-removers. It cannot be washed with water because this may cause even more stains. It's a good practice to vacuum clean it regularly, especially if you are allergic to dust and mites. If you want to further protect your futon, we also offer Futon covers made with the same fabric of the mattress. In the first few months, the futon must be turned over several times in order to ensure an even compression of the cotton inside it. If your futon is placed on a tatami, we recommend to regularly check if moisture has formed under the mattress. In humid environments, it's a good practice to lightly fold the mattress from time to time to allow the tatami and futon to air out and release moisture. Click on the images to have more information about the products and the prices!